Booster Club Events. <BR> This is an amazing inexpensive product that you can customize with colors of your choice! Great color options to match school colors or corporate events! Thousands of color combinations are possible. First select a unique body color from our palette of thirteen custom colors...choose the assorted color option at no additional cost if you want to mix it up. Next offset the body color with a dazzling resonator cap color. Now you get a choice to add a personalized message. You can customize the body with a logo and/or two line text message available in eleven foil imprint possibilities!! This is crazy..no where else can you have this much fun at such a low cost. People will be amazed at how clever you are with the tools we have available to make your kazoo and event a real success story. 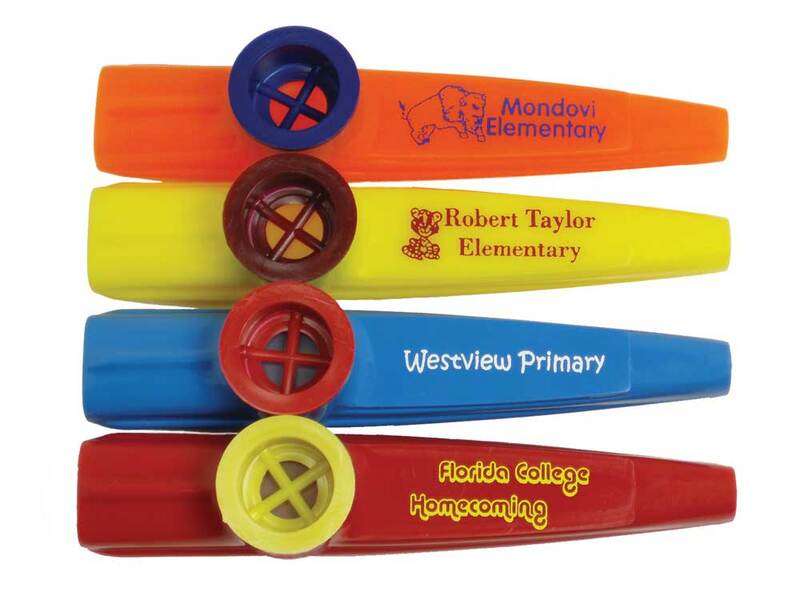 Get in front of the crowd with your custom personalized kazoo from Music Treasures Company. Quantity options are listed below and 4-6 week lead-time is required for processing. A $45.00 die/stamp charge will be included for your first order. This charge will not apply to Re-orders. Additional charges may apply for logo art. Please call or e-mail for details. Pre-Production samples of your actual order are possible. Set-up and die charges ($100.00) and next day air charges would apply and are not refundable. This would allow you to review the actual product sample you are ordering. You will be responsible for the pre-production costs but will not be committed to the actual production lot of the order for whatever reason. Color samples are available so you can review the actual body color, resonator cap color. If over-run imprints are available in the color of your choice these will be included. This option will allow you a pre-production review of the product color combination but will not include your logo. The color review combo is $8.00 plus shipping cost. Call our customer service department for execution of these special services.